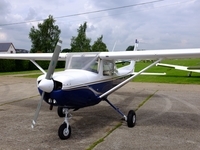 Product review: Jeff Broad – by anon, 28 Jun 15 5/5 Excellent "Initial contact poor, but once in touch with Pilot at Doncaster Airport, he was excellent easy to find. The Staff were helpful and informative the ride was thrilling / scary all at the same time, would do it all again and certainly recommend to friends. Would have liked a photo souvinier, it wasnt offered.. My wide took a photo from behind the fence, but was too far away 1st time with Experiences 4 all...WOULD RECOMMEND THEM "
My initial contact was very helpful immediately and a suitable date was arranged. Unfortunately due to bad weather this date had to be postponed and also a second date due to bad weather.3rd time lucky! The venue was Robin Hood Airport and we are familiar with the location. The route, once at the airport to the flight office was well described. Facilities were excellent. Richard my instructor was very friendly and explained concisely his instructions which were easily understood. (This was my third flight experience in a Cessna). The aeroplane was very suitable. (Briefing)Richard explained well involving all safety aspects. I did ask a number of questions and was more than satisfied with the answers. I thoroughly enjoyed the experience again and was given enough opportunities to fly and manoevre the plane. If I had the money I would certainly apply for a pilot's Licence. Highly recommended. My wife arranged this (unknown to me until I was presented with the gift). Good communication (experiences4all). Easy to arrange - no problems.